It enjoys a sunny and quiet location, 633 m above sea level, and offers fantastic views of Kalkalpen National Park. With regional specialities, most of which come from our own production, and carefully designed comfort rooms (4 double rooms and 2 single), guests' well-being is our priority. Our many regular guests greatly appreciate the offer of half board (on request). We also offer guided walks in and around Kalkalpen National Park. Guests are guaranteed adventure and relaxation on the 520 km of marked cycle trails and mountain bike trails which lead through the national park. Ours is still a 'proper' farm! The cows are still milked, calves are born and chickens lay eggs. This is always a very special experience for children. There's more for the younger guests to enjoy at the children's playground too. The playhouse with its slide, a swing and a sandpit are the place to be between breakfast and dinner. And the best way to finish off the day is by the camp fire. Bring your own laptop with you to take advantage of our complimentary wireless Internet access. 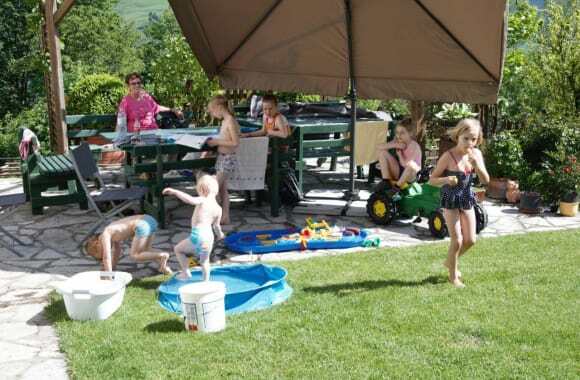 Prices: B&B/day/person: From EUR 32 HB/day/person: From EUR 42 child discount! We are a member of the 'Nationalparkhöfen' (national park farms) association! Visit 1 farm - enjoy 10 times the adventure! The organic farm lies in a sunny and quiet location, 633 m above sea level, and has fantastic views of Kalkalpen National Park. The farm is a starting point for many beautiful snowshoe hikes. When there is enough snow, you can use the local marked cross-country ski run. You can borrow 4 pairs of snowshoes here free of charge. Should you need any more, you can hire them at the national park centre for a small fee. They also offer guided snowshoe hikes. 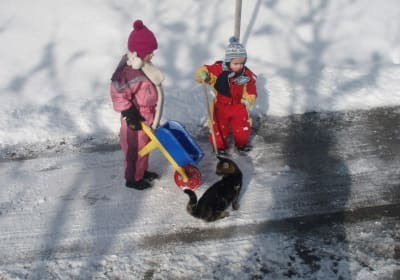 Children can rollick about in the snow, go sledging or build a snowman, all to their heart's content. You can also borrow two sleighs from us. A further highlight is Bavarian curling at Guesthouse Schraml "Rau" in Pechgraben. If interested, please inform us when making your reservation, then we can enquire whether an alley is available there. We offer a very low-priced ski trip package in cooperation with Forsteralm valley in Gaflenz. Please state your interest when making a request. And the best way to finish the day is in the cosy farmhouse parlour. With regional specialities, most of which come from our own farm, and carefully designed deluxe rooms (7 double rooms and 1 single room), the well-being of our guests is our priority. We are a member of the 'Nationalparkhöfen' (national park farms) association! Visit 1 farm - enjoy 10 times the adventure. 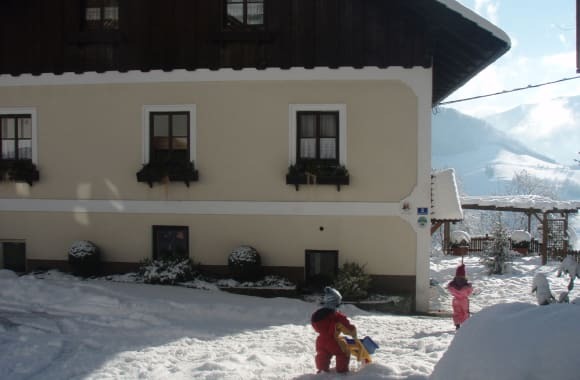 Prices: B&B/day/person: From EUR 31 HB/day/person: From EUR 41 child discount. Our farm is home to many animals! Our 14 cows are milked twice a day, the young cattle are fed in winter in the barn and in summer are kept on the pasture. There are also little calves around throughout the year in and on the farm which are great to watch and pet. We also have a pig, 2 rabbits, 10 chickens including a cockerel, cats and our dog Heidi. Spacious double room with shower/WC. View of the northern side, equipped same as double room. The rooms are particularly bright and pleasant and are furnished with solid wood furniture. They have a double bed, a nightstand, a cupboard, a table and a wardrobe. In each room a baby cot is provided and some also have a sofa bed. The bathroom features a washbasin, a shower, a WC, surfaces, a hook for hanging a dressing gown on and of course hand towels and bath towels. Our family room consists of 2 separate, spacious and bright rooms. Each room has a double bed and an extra bed, there is also plenty of room for a baby cot. The bathroom is between the two rooms, the WC is separate and from the balcony there is wonderful view of our large vegetable garden, the pasture for the calves and the forest.